xvii, 200 leaves : ill. ; 28 cm. Thesis (Ph. D.)--University of Florida, 1980. Includes bibliographical references (leaves 192-198). stimulating interaction in the principles of systems ecology and, in particular, for the past 3 yr of graduate study at the University of Florida. I would also like to thank the other members of my conmmittee: Dr. P. L. Brezonik, Dr. J. P. Giesy, Dr. F. Nordlie, and Dr. T. Crisman, who all gave me valuable guidance through class lectures, field excursions, and work supervision. The cadmium streams study was made possible through an interagency agreement (IAG-D6-0369-1) between the Environmental Protection Agency (EPA) and the Department of Energy, with Dr. Harvey Holmes as project officer. In addition to the fine staff who worked on this project, my special thanks go to Dr. Henry Kania, the spiritual leader of the streams project and myself for many years. Thanks also go to Dr. Larry Burns, who served as project officer on EPA Grant No. R-806080, "Energy Model and Analysis of a Cadmium Stream with a Study Correlating Embodied Energy and Toxicity Effect," under which a portion of this research was completed. I would also like to thank Mr. Tom Cavanaugh, Mr. Jim Lowry, and many other employees of the American Broadcasting Corporation for the use of facilities at Silver Springs as well as information concerning the history of the biological communities. friends who found the time and energy to leave their work and studies for the rigors of fieldwork at Silver Springs. The staff of the Center for Wetlands helped make this dissertation and earlier project reports a reality through fine editing, typing, and drafting skills. My final thanks go the my wife, Gail, and my father, Dr. Kenneth L. Knight, both of whom have served as levels of excellence to which I aspire. power, ability to amplify and control may be in proportion to embodied energy. The evaluation of control effect and energy required in equivalent embodied energy units allows the direct correlation of these two properties of a generalized controller. This "control hypothesis" was examined using biological consumers and a toxic metal as examples of ecosystem controllers. hypothesis for a toxin. A literature review indicated a stimulatory (Arndt-Schulz) effect of Cd at low concentrations in many laboratory studies. Most data sets were found to be described by a general subsidy-stress curve. The bioconcentration of Cd as a mechanism in natural systems for controlling free Cd concentration and its toxic effect are discussed. was evaluated. Calculations suggest that the world geologic cycle is producing economically recoverable Cd at a slow pace, only 53 kg-yr-1. The energy transformation ratio of this Cd is 2.5 x 1016 Solar Equivalent Calories (S.E. Cal)-g Cd-1, or 6.4 x 1017 S.E. CalCal-. The industrial concentration of Cd adds an additional 4.6 x 10 S.E. Calog Cd-1 in the synthesis of the pure metal. A calculation of the biological concentration in experimental stream systems indicated that 1.3 x 10 S.E. Cal-g Cd-1 are required for biological concentration to 0.8 ppm on a live-weight basis. Information collected during research on Cd effects in experimental streams was summuarized and used to calibrate an energy and material model of the Cd streams. Several mechanisms of Cd toxicity were examined, and the model includes a stimulation of system components at low Cd levels. Simulation results allowed a detailed correlation of the relationship between embodied energy in Cd and the Cd effect in equal units. This correlation was found to be first positive, then negative, and eventually approached zero at higher Cd concentrati ons. Consumer control was studied at Silver Springs, Florida. Total system metabolism was measured and compared to published data. Although major alterations in some top consumers have occurred (catfish and mullet largely replaced by gizzard shad), system primary productivity was little altered after about 24 yr.
measured in these microcosms along a gradient of increasing consumer densities. Typical subsidy-stress curves were found for herbivorous consumers (snails), carnivorous consumers (mosquito fish), and a toxin (Cd). Maximum primary productivity was measured at consumer densities similar to the actual measured densities in the adapted river ecosystem. The results of these studies with a single toxin and a few consumer organisms are predicted to be general to controllers in other systems. Tables of embodied energy values for controllers and their resulting energy effect may be useful to environmental engineers in the wise management of ecosystems. The study of the mechanisms controlling environmental systems is essential for understanding ecosystems and for managing them rationally. The discovery of general principles of control spanning many different types of systems may improve symbiotic relationships between human civilization and the environment. The purpose of this research is to develop a quantitative means to evaluate, compare, and utilize controllers in environmental management and to illustrate the approach with examples from aquatic ecosystems. In particular, consumer control at Silver Springs, Florida, was quantified and compared to toxin control by the heavy metal cadmium (Cd) in stream microcosms. A "controller" is a chemical substance or biological component that has the ability to divert, enhance, or stop energy flows that are greater than its own energy content. Predators may regulate prey populations while chemical substances may control the predators. Small quantities of a controller may have strong feedback effects in biological systems. through convergence of webs or concentrating factors. In systems selected for maximum energy flow, controllers may be used to manipulate productive processes through positive amplification. The theory suggests that controllers will have an energy consumption from the system that is proportional to their value as a stimulant to productivity and that natural selective processes will eliminate items that use more energy than they stimulate. In an immature system, two values of a controller, i.e., the embodied energy and the amplifier effect, might be widely different, but in an adapted system they must balance or a more productive arrangement will be selected. Thus, an adapted system requires consumers and may be able to use toxins. In this study the controlling action of Cd is quantified using an energy-mass model calibrated from stream microcosms. In addition, the controlling role of Cd is summarized from other published studies, and a general toxicity function is presented. The subject of control by consumer organisms was studied during a 2-yr period at Silver Springs. In addition to a whole-system experiment made possible by alterations in the river ecosystem and a previous system study by Odum (1957), controlled experiments of consumer manipulations were made in submerged microcosms in the river channel. The generality of control in ecosystems is demonstrated through simple computer models and a single microcosm experiment with Cd as the consumer. was made in order to generalize control processes in ecological systems. In particular, experimental work dealing with the effects of consumer and Cd manipulations on system-level parameters, such as primary production, was included. The mechanistic processes that may lead to system control were identified by these authors and summnarized in a series of minimodels using the energy circuit language of Odum (1975). Similarities between these models were easily seen and incorporated into the more complex control model of a stream ecosystem presented in Section 4. Six experimental streams were operated as microcosms receiving two different Cd treatments. Detailed descriptions of the methods used in the Cd-streams study were presented by Giesy et al. (1979). The author of this dissertation was a participant in the Cd-streams study, with responsibility for measuring periphyton dynamics, system metabolism, and export. located in Aiken County, South Carolina, on the Savannah River Plant, which is operated by the United States Department of Energy. The streams were built with funds provided by the Environmental Protection Agency to study the fate of pollutants in natural water systems. Previous work at this site has included studies of the fate of NTA and mercury in stream ecosystems (Kania and Beyers 1914; Kania et al. 1976). 0.05-cm thick black polyvinyl chloride (PVC) film. Washed quartz sand was distributed in the channels to a uniform depth of 5 cm, and a 10-cm layer of natural streambed sediment was distributed in the pools5. Water for the channels was taken from a deep well and mixed with a hydrated lime slurry before being added to the systems. Major parameters of input water quality are listed in Table 2.1 and indicate the soft, low organic carbon nature of the stream water. Flows were maintained continuously at 95 L-min-1 and resulted in a water depth of 20 cm in the channels. The mean water retention time and current were 2 hr and 1.3 cm-s1, respectively. streams input water after treatment with hydrated lime. and Gratiola virginiana, which had naturally colonized the channels during previous studies, were transplanted into the systems. Consumer organisms consisting of clams, crayfish, and two species of fish (mosquito fish and bluegill) were added to the systems after some plant growth had occurred. Cadmium inputs into four of the six channels began on March 18, 1976. Cadmium (as CdCl2) was metered into the turbulent region of the head pools with a 4-channel peristaltic tubing pump. The Cd levels established were 5 p~gL-1 in two channels and 10 pg-L-1 in another two, with the remaining two channels serving as controls. Cadmium inputs were discontinued on March 18, 1977, a full year after they began, and data were collected for 5 mo after that date. U.2b-m2 sections of sediment and associated plants were removed from each channel, and plant biomass per unit area by species was cal cul ated. Quantitative samples for macroinvertebrates and microinvertebrates were taken on a routine basis from plate samplers and polyurethane sponges. Most organisms were identified as to species, and biomass and Cd concentrations were measured when practical. Measurements of total community primary production and respiration were made over 24-hr periods by measuring upstream-downstream change in oxygen by a method adapted from Odum (1956). Water samples were removed from the streams by siphon at 2-hr intervals and dissolved oxygen (DO) content was determined using a YSI model 54 DO meter calibrated using the azide modification of the Winkler method (American Public Health Association 1975). were recorded for each hour during day and night. Probes were calibrated several times during each 24-hr period. S = saturation deficit, calculated as S = (100 % saturat ion)! 100. A positive diffusion value indicates oxygen diffusion into the water and therefore changes in DO are corrected by subtracting 0. Values of k between 0.04 and 0.8 g 02 m2hr-1 were measured in the streams using the floating-dome method of Copeland and Duffer (1964) modified by McKellar (1975). Values of k between 0.1 and 1.0 were used in the productivity calculations depending on weather conditions, with the highest value used for windy and rainy days. In no case did the diffusion correction alter metabolism values by more than 10% of their uncorrected values. (PG) was the area above this average R line, and net photosynthesis (Pnet) equals PG-R24. P/R ratios were calculated as PG/R24. Exported organic material and associated Cd were quantified from October 1976 to August 1977. All effluent water from each channel was passed through a 4-in. plastic pipe that contained a motordriven, stainless-steel mixer blade. Material collected on the end screens was washed into the sampling system daily. Mixed effluent was subsampled from each channel at a rate of 4 L-d-1 with a peristaltic pump. These subsamples were filtered onto prefired, Gelman A-E glass-fiber filters, dried, weighed, ashed at 450C, and reweighed to obtain ash-free dry weight of exported material. From the length of sampling, the volume of water exported, and the volume of the collected subsample, channel export was calculated as g'm-2 channel bottom'd-1. 30-ml porcelain crucibles with 2 ml of concentrated nitric acid at 80'C for 1-3 hr or until all solid material had dissolved and NO2 evolution ceased. The samples were cooled, 2 ml of 30% hydrogen peroxide added, and reheated until gas evolution ceased. Samples were cooled to room temperature, diluted volumetrically using deionized water, and stored in acid-washed polyethylene bottles. dards. Standard addition curves had the same slope as curves constructed from standards in distilled water, indicating that the selected charring and atomization time and temperature regime removed most matrix interferences. water with crayfish (Thorp et al. 1979), mosquito fish (Giesy et al. 1977; Williams and Giesy 1978), and leaf decomposition (Giesy 1978). north-central Florida in Marion County, east of Ocala. Two billion liters of water flow each day from one major boil and numerous smaller boils forming the Silver River, which flows with only minor dilution for 11 km to its confluence with the Oklawaha River (U.S. Geological Survey 1978). Typical water chemistry of this spring water (Table 2.2) remains unchanged since measurements were taken in 1907 (Rosenau et al. 1977). The data indicate water of moderate hardness, low DO, low organic carbon, and moderate levels of the primary plant nutrients (nitrogen and phosphorus). prevent major alterations in the aquatic community. The biological communities are the same as those described by Odum (1957) with the exception of the change in dominant fish from mullet to shad as discussed in the results section of this dissertation. Figure 2.1 is a map of the river area described in this report. System productivity measurements were made for the entire upper section of the river to a point where the river narrows and enters a more shaded run 1200 m downstream from the main boil, covering an area approximately 76,000 m2 (Odum 1957). energy input was integrated from a recording solar pyranometer on the days when diurnals were run. Upstream and downstream curves of DO were each shifted by onehalf of the flow time between stations (1.6 hr), and an hourly rateof-change curve was constructed by multiplying the oxygen changes by the average depth of 1.8 m (Odum 1957). Two corrections were applied to this curve to account for other oxygen sources and sinks. First, the accrual of oxygen from side boils with higher DO was corrected by subtracting 0.61 mg DO'171 from all downstream measurements (Odum 1957). Second, corrections for oxygen diffusion are necessary because of the consistently undersaturated DO values in the river and they were made using Eq. 2.1 and the average percent-saturation values calculated from the measured DO and temperature values. Odum's (1957) value for k was applied to new data in order to compare results with his. He used a value of 1.82 g 2m 2hat 100% saturation deficit, which he derived from a combination of estimates. In this study, an independent measurement of k was also obtained. The diffusion rate of oxygen was measured in several locations of the study area using McKellar's (1975) modification of the floating-dome technique. A large range of diffusion coefficients was measured (0.11 to 5.15 g 02m-2hr-1 at 100% saturation deficit) (Fig. 2.2a). These values were closely correlated to the measured current velocity (Fig. 2.2b), and an average value of 1.72 g 02*m-2hrl1 was determined for the entire 76,000 m2 of river area studied. This measured value is not appreciably different from the above value estimated by Odum. Populations of large fish (>10 cm long) were estimated by visual survey on October 20, 1978, and on April 11, May 16, July 17, and October 22, 1979. The author wore a face mask and snorkel and was towed in a criss-cross fashion down the spring run while holding the bow of a boat. All fish seen were counted, and the numbers in general groups or specific species were reported to an assistant in the boat. A survey of the 76,000-m2 area took about 1 hr to complete. Northcote and Wilke (1963) reported good agreement between visual fish counts and rotenone poisoning techniques for larger fish in clear-water environments. At Silver Springs it may be assumed that the visual counts are an underestimate with greatest accuracy for the larger free-ranging fish such as shad, bass, mullet, and bluegill sunfish; and less accurate for the secretive or smaller species such as spotted gar or small sunfish. Snail populations were estimated in a low current-velocity cove near the 1200-m station for comparison to microcosm data. A stiffhandled net with a 0.0671-m2 opening was used to sweep the Sagittaria beds in this cove, which are the habitats of the snails studied. Several passes were made and the captured snails were sorted and weighed for live weight. These values are reported on a m2 basis by multiplying the volume of water and plants sampled by the average depth of the sample area. tubing located 1 m above the river's bottom and 2 m below the water's surface. the length of the tubes (6 in). 7.6-cm inside diameter PVC pipe. This reducer acted as a funnel to increase internal pressure and flow rate in the microcosm. The downstream fitting consisted of two sections of 7.6-cm PVC pipe connected by a PVC union with a standard garden hose connector inserted in the side. The polyethylene microcosm tube was attached at each end to the short pieces of PVC pipe with hose clamps. The additional piece of pipe at the downstream end assured that the water pumped from the microcosms through the hose fitting would not entrain water from, outside the microcosm. The adequacy of this extender was verified by releasing rhodamine dye into the end and observing that, with the pump on, there was no movement upstream towards the sampling port. The replaceable portion of the microcosms consisted of continuous 9-cm diameter polyethylene tubing. Initial studies determined an optimal microcosm length of 6 m for subsequent studies. At greater lengths, upstream-downstream DO changes were increased, but the flow rate was insufficient to sustain internal pressure in the tubes and they were partly collapsed at the downstream end. New 6-m lengths of polyethylene tubing were used for each study. the river's current by two racks. The racks were loosely anchored to the stream bottom by ropes and concrete blocks and held 1 m off the bottom by floats. Thus, the microcosm tubes were maintained 2 m below the water surface. Because these systems were submerged, they required no corrections for oxygen diffusion and were safe from vandalism. Metabolism of the enclosed microcosms was measured by upstreamdownstream DO changes. For DO measurement, water was pumped from the microcosms through garden hoses using a 12-volt impeller pump. One hose led to the upstream rack and was used to measure the DO of water before it entered the tubes. A hose was also attached to the downstream end of each microcosm for measurement of the final DO of water after it passed through the tubes. The nine resulting hoses were attached to nine gate valves from which a manifold directed the water to one hose connected to the inlet side of the pump (see Fig. 2.3). Water from the outlet side of the pump was passed through another hose to fill and overflow a small container housing a standard DO and temperature probe. Since the hose and pump system from the microcosm to the probe was air tight, no atmospheric oxygen could contaminate the water before the measurement. the DO value was recorded at 10-s intervals for 1 min. The six resulting DO values were averaged to give a 1-min integrated reading for each microcosm. At the end of these readings this valve was closed and the next valve was opened. After a 3-mmn wait, DO was again recorded for 1 min, the valve was closed, and the upstream valve was reopened. The upstream (ambient) DO readings were much less variable and therefore one reading was taken after 2 min of equilibration. Using this technique one average measurement from each of the eight microcosms could be made in a 40-mmn period with upstream values interspersed between each pair of measurements. with each daylight DO reading using a submersible sensor at the depth of the microcosms. Values were automatically integrated over a 100-s interval for each reading. Solar radiation measured as moles of photons (Einsteins) was converted to total energy by applying the conversion factor of 52.27 Cal-Einstein-1 calculated for sun and sky radiation from McCree (1972). Upstream-downstream DO measurements were made for two 8-hr periods on each sampling date. Oxygen rate-of-change curves were integrated for each microcosm to calculate system metabolism. Daylight DO increases measure net production, and nighttime decreases measure system respiration. Graphical areas in ppm-hr were converted to metabolism estimates by multiplying by the average thickness of the microcosm tubes (7.05 cm) and dividing by the flow time of a water mass through the tubes. This method gave the average metabolism in g 02-m-2 during the measurement period. microcosms and was found to be low in all of the experiments (<10% of net production); therefore, respiration was not used in comparing the various treatments, and net production may approximately equal gross production. To normalize data from different sampling dates with different solar inputs, net production data were divided by the measured solar energy giving values in 9 02-Cal-1. timing rhodamine dye released at the upstream end. These flows were measured at the beginning of each study and in a few cases while a study was in progress. abundant snail, Goniobasis floridense, on primary production. This species is an important component of spring runs throughout northcentral Florida and feeds on periphytic algae. Snails were collected from the submerged macrophytes in slow-current areas of the river near the experimental site. Three microcosms served as controls, and the other five received from 20 to 325 snails each. Snails were live-weighed using a triple-beam balance. pulled out of the river, and all snails were removed, counted, and wei ghed. as the regulated organism. Clean microcosms were placed in the river on April 7, 1980. Three tubes served as controls and the other five received from 11 to 80 fish each. The fish were weighed and placed in the microcosms on April 7. Measurements of net production were made 7, 9, and 14 days after the experiment began. The microcosms were pulled out on April 30, and all remaining fish were counted and weighed. Cd strips were removed from the microcosms on August 19, air-dried, and reweighed at the laboratory. An energy and matter flow model of the artificial streams was constructed first as a diagram using the energy circuit language of Odum (1971, 1975). The model is of intermediate complexity, combining storages of nutrients, algae, macrophytes, consumers, and detritus and their uptake of and response to Cd at different concentrations. Further details of the model are described in the results section. The major biomass storages and their Cd content were monitored throughout the 2-yr study and have been used directly to calibrate the model when possible. However, few of the data were for average levels throughout the microcosms, but rather were for concentrations on replicable substrates. Thus, to calibrate the model to wholesystem averages, assumptions and extrapolations from a few measurements were made to other data. Also, few of the rates were actually measured during the project other than Cd uptake and release, system production and respiration, and export; therefore, a considerable amount of parameterization was done by simulating the model and comparing results to the actual measured storages over time. Specific rates from the literature were used when available. Intercolor desk top microcomputer. Integration was by means of simple difference equations with variable time steps. The model evolved considerably during the 12-mo period of simulations as mechanisms were seen to be inconsistent with actual data or as other mechanisms that were necessary to generate the observed results became clear. Calculations of embodied energy are made according to the conventions set forth by Odum (1978). A model is prepared showing the major energy flows responsible for generating the flow of interest in order to calculate the energy embodied in a particular energy flow or storage. If these flows can be estimated in terms of energy of one quality such as Solar Equivalent Calories (S.E. Cal), and double counting of sources is eliminated, then these energies may be added to calculate an estimate of embodied energy in the products. Precise values of energy quality of many energy types and flows are not yet known, so all calculations are assumed to be preliminary until some future time. The embodied energy of a storage is taken as the integrated input energy flow over the time of growth to a steady state level. The by-products of a production or concentration process are assumed to have the same energy embodied in their energy flows. Energy Effect T. .
-10,000 S.E. Cal'ug Cd-1 at the specified Cd concentration if we assume a quality factor for primary productivity of 1000 S.E. Cal'Cal-1. The energy effect of a controlling substance may be a function of its concentration, and therefore the concentration must be specified for comparisons. As with embodied energy calculations, energy effect calculations are in a learning stage and subject to revision. seem to be as variable a subject as the number of existing chemicals and organisms. In order to identify general principles of control, some principles that are general to all real systems are reviewed. Included is a concept of "embodied energy" that evaluates energies of differing qualities. Literature on consumer control and Cd toxicity .is reviewed with simple models demonstrating points of generality to all systems. The designs of systems and their ways of processing toxins are related to energy. Lotka (1922) proposed a principle of thermodynamics for open systems stating that selection in the struggle for existence is based on maximum energy use (power). Later, Odum and Pinkerton (1955) and Odum (1968, 1971, 1979) suggested ways control actions generate more power and thus tend to persist in real, competing systems. theory. Useful power is a measure of the energy flows and transformations that result in structures or processes feeding back to help maintain themselves and the system that supports them. Thus, useful power differs from dissipation of energy that is not part of a selfmaintaining system. The conceptual idea of maximum power is illustrated by an autocatalytic unit (Fig. 3.1). In this simple model, a nonlinear interaction acts to accelerate energy flow to the maximum sustainable level. The generality of autocatalysis is some measure of support for the theory that systems are selected for maximum power. Observation indicates that there is more to the maximization of power of natural systems than just rapid growth, depletion, and loss of a storage. The surviving systems have mechanisms to sustain the cycling of materials to facilitate the overall energy being processed by the system (system power)-. Tuned complexity is a criterion for maximum power in competing systems, and the diversity of natural systems is further circumstantial evidence in support of this theory. The power of a system may be limited by the quantity of usable energy sources and by the constraints of energy transformation. These limits to the growth of power of a system are not reached immediately, but are approached in time after succession and evolution. its power by using additional energies has a competitive advantage over other systems. Energy may be used to meet all contingencies. limited in its power level by the energy required for each transformation. This observed energy for transformation is described by the second law of thermodynamics as a necessary decrease of available work energy in most energy-transforming processes. In other words, much energy is converted to a lower quality state when a transformation to another type occurs. This phenomenon has been quantified in various branches of science and was summarized by Odum and Pinkerton (1955). Their review of physical and biological systems concluded that maximum power level is possible only at lower-than-maximum efficiency for competing systems and may be at 50% transformation efficiency for a single storing process. The necessary loss to unusable heat limits the total number of transformation possible for any energy entering a system and results in a predictable spectrum of energy transformers in all adapted systems (Odum 1979). All systems are but subsystems within larger competing systems and thus are exposed to control by the next system's deterministic behavior. Therefore, biological systems such as mature forests or ancient lakes may be greatly simplified by volcanic eruptions or human toxic wastes, resulting in a decreased local power level but an increased power at the next larger scale. Circumstantial evidence is available to show that many systems are on a successional and evolutionary course towards the maximum power level within the boundaries of their exogenous controls. Biological food chains represent concentrations of energy, with each level requiring energy diverted from the machinery of primary production. This diverted energy must be compensated for by energies fed back from storages to capture greater free energy for the system. Thus, a control hypothesis follows directly from the maximum power theory. In adapted systems, components must have controlling actions that are proportional to their energy of transformation. Since poisons may be powerful controllers of ecosystems, knowledge of stimulative roles of poisons may be used to enhance productivity and manage systems. More control may be achieved by using toxins to control consumer organisms that, in turn, have controlling roles. If a toxin occurs at low concentration, biological energies may be used to concentrate it to a stimulatory level; or, if the natural concentration of a toxin is high, biological energy may be used to detoxify the substance by reducing its effective concentration in the environment. of one type necessary to make another type is embodied in the energy of the second type. If we divide the energy of one type necessary to produce another by the energy of the second type, we have the ratio of "energy transformation." This dimensionless parameter (efficiency) has been called the "energy quality factor" or the "energy transformation ratio" (TR) by Odum (1978) and may be assumed to have some theoretically minimum value in competing systems. When transformation ratios for various processes are related to energy of one type (e.g., S.E. Cal or Coal Equivalent Calories [C.E. Call), we have a parameter to compare quality of all types of energy or matter. In order to evaluate the primary energy necessary to produce an energy flow after several transformations, we must recognize that the energy necessary to produce the intermediaries is necessary to the production of the final product. Thus, if a food-chain system were relying on a single input source, the embodied energy for all energy flows and storages would be evaluated in terms of the single incoming energy flow. If a production process has more than one major energy input, then the embodied energies of all inputs must be summed to evaluate the energy quality of the resulting products. In most systems, some of the auxiliary energies of the process are fed back from the products and therefore must not be added to avoid double counting. Examples of energy transformation ratio calculations are included below, or, for a more detailed discussion of this concept, see Odum (1978). The quantification of "embodied energy" in consumers may date to Lindeman (1942) when he calculated ratios of energy transfer in an aquatic ecosystem. His energy ratios give a preliminary idea of the energy of one type required to form energy of another type. However, Lindeman neglected auxiliary energies in his calculations and had no clear scheme of energy quality relationships. 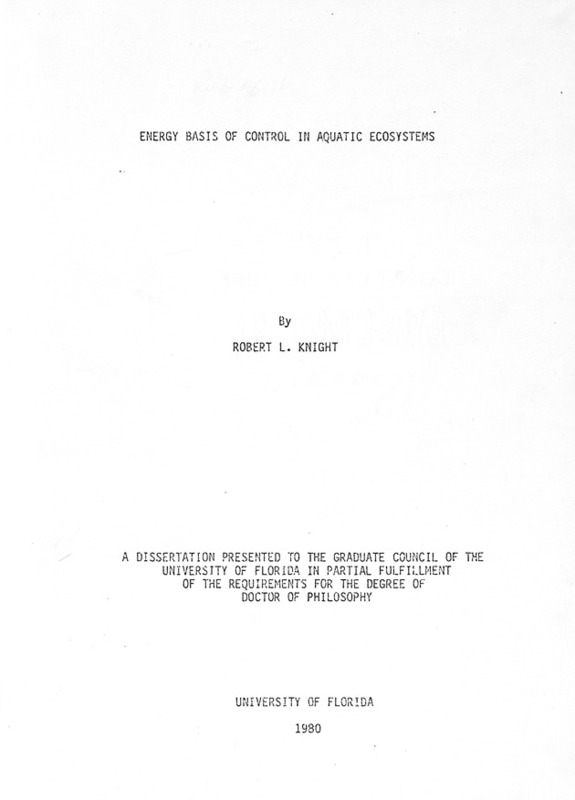 The energy quality conventions set forth by Odum (1978) allow more accurate quantification of the energy requirement of consumers in biological systems. Figure 3.2 presents a simple food-chain model that summarizes the energy flows necessary for TR calculations. consumers to get energy transformation ratios. great as gross primary production (GPP), the TR of primary carnivore metabolism was 25X GPP, and the TR of top carnivore metabolism was 10OX GPP. If we take the TR of GPP to be about 1000 S.E. Cal.Cal-1, then the TR for herbivores is 5000 S.E. Cal-Cal-l; the primary carnivore value is 25,000 S.E. Cal.Cal-1; and the top carnivore TR is 100,000 S.E. Cal'Cal-I. (1977) reported ranges of TR for the various trophic levels depending on their place in the grazing or the detritus food chains. He reported herbivores as between 280 and 3000 S.E. Cal-Cal-1; primary carnivores between 840 and 10,440 S.E. Cal.Cal-1; and higher carnivores between 2880 and 126,400 S.E. Cal.Ca1-1. These values are for the storage of biomass rather than the rate of metabolism. (1980) reported TR for the respiration of the various trophic levels. For zooplankton and benthic invertebrate consumers, he found a TR of 1200 S.E. Cal.Cal-1; for primary and secondary fish consumers he reported 34,000 S.E. Cal.Cal-1; and for higher level consumers he reported values between 170,000 and 1.8 x 107 S.E. Cal.Cal-1 of metabolism. any substance, and the total energy degraded to heat in the coupled process of Cd concentration is the "embodied energy." The embodied energy of Cd may be calculated at various concentrations and in different systems to evaluate its role as a toxin or stimulator of metabolism. Calculated values of embodied energy may be based on global averages or specific production cases. Because of the statistical uncertainties in data and also because specific cases may not have been evolving long enough to develop the adaptations for maximum power, the numbers resulting may be subject to considerable variability and revision. Of most importance in this work are comparisons of energy required for Cd concentration in different systems and the relationship of energy required to the feedback effect. order to set a baseline for the calculation of energy embodied by the earth's production process of Cd ore.
contain only 53 kg Cd'yr-1 for the entire earth. energy or solar-produced hydrologic energy (Flow B) was used as the major input to this concentration process, although traditional view regards residual deep heat (Flow A) as a separate input to ore production processes. As mentioned above, the earth's average crustal concentration of Zn and Cd was taken as zero-embodied energy because these elements cannot be used in work processes at such low densities. Therefore, Flow C in Fig. 3.3 is equal to zero. Flow B is the rate of energy absorption from the sun by the entire earth system, and was taken as 13.4 x 1020 Cal-yr-1 (Sellars 1965). (9 x 106 t Cd)/(1.7 x 108 yr) = 53 kg Cd-yr-1. Thus, Flow D in Fig. 3.3 is 265 t of recoverable Zn ore'yr-1 for the whole world, or 10.6 t Zn and 53 kg Cd in ore produced each year. At a world mining rate of about 5.4 x 106 t Zn and 17 x 103 t Cd in 1978, the depletable nature of these resources is obvious. = 2.5 x 1019 S.E. Calbkg Cd-1 in ore.
ore resulting in 1 kg of pure Cd as illustrated in Figs. 3.4-3.5.
aFrom Petrick et al. (1979), 492 kg Zn concentrate with 60% Zn; 90% recovery from ore with 4% Zn content. bFrom this report, page 38.
cBattelle Columbus Laboratories (BCL) (1975) total energy costs in Zn production converted to electrical Btu. dFrom Odum and Odum (1980). eFrom BCL (1975), $36.34 materials and reagents; from Cammarota (1978), $36.34 labor and $22.80 capital assuming 20-yr life for plant. fOdum et al. (1980). i79% efficiency of recovery from ore (Cammarota and Lucas 1977). with actua] energy and dollar flows evaluated. Cadmium production is entirely a by-product recovery of Zn purification. See Table 3.1. Figure 3.5. Aggregated model of Zn and Cd production with flows evaluated in terms of Solar Equivalent Calories. TRpure Zn = 1.6 x 1017 S.E. Calkg pure Zn-1 TRpure Cd = 4.2 x 1019 S.E. Cal-kg pure Cd-1. Although the industrial embodied energy inputs in the Cd purification process are much smaller than the environmental energies, they represent the minimum amplification ability that the Cd must have in the human system. Thus, metals such as these may be used very inefficiently compared to their actual embodied energy because of the cheapness of their extraction from world storages. If the embodied energy in pure Gd is evaluated only from the industrial energy inputs, 4.6 x 1010 S.E. Cal-kg pure Cd-1 is calculated, a much smaller quantity of embodied energy. 6 x 105 S.E. Cal'Cal-1 for mined phosphorus (Odum and Odum 1980) or 1.4 x 104 S.E. Cal'Cal-1 for goods and services in the United States economy (Odum et al. 1980). Biological concentration. As discussed earlier in this section, most biological components have the ability to concentrate Cd to elevated levels over water concentrations. This concentration represents an embodiment of solar energy into upgraded Cd storage. Several calculations of biological Cd processing are made in this section. embodied energies are integrated over the time indicated on the graph. Figure 3.6. Evaluation of Cd embodied energy in biological systems. Section 4, 1.68 x 106 S.E. Cal'm-2 of stream was calculated to attain equilibrium Cd concentrations in the biological components. For the control channels this energy input resulted in 1256 ug Cd.m-2 stored in the biological community. Not including the energy embodied in the Cd by the next larger system, 1.3 x 109 S.E. Cal-g Cd-1 was calculated to be required to develop a concentration of 0.8 ppm on a live-weight basis. 0.020 g Cd-m-2, respectively. Adding the input energies and dividing by the Cd storages gives 2.26 x 109 S.E. Cal-g Cd-1 at a biological concentration of 7.5 ppm, and 2.92 x 109 S.E. Cal.g Cd-I at 11.6 ppm. Chew (1974), Mattson and Addy (1975), Owen and Wiegert (1976), Batzli (1978), and Kitchell et al. (1979). These authors outline basic mechanisms of consumer populations in the regulation and enhancement of system energy flow such as nutrient regeneration and cropping of density-dependent primary prodiicers. Effort (1972) and Chew (1974) suggest the need for experiments designed to quantify consumer effects by regulating consumers over realistic density ranges. The consensus of the literature is that consumers are indeed important in energy flow but for what reason and to what degree are still unclear. The wealth of data concerning consumer effects in terrestrial ecosystems is overwhelming as indicated in the reviews mentioned above. Grazing of terrestrial systems by herbivorous mammals and insects has consistently been found to stimulate the net productivity of those systems. The principles of control discussed in this dissertation are possibly general to all systems; however, the following literature review of consumer control is limited to only aquatic ecosystems. Some of the earliest recognition of consumer control includes the prey-predator interaction models of Lotka (1925) and Volterra (1926). In these models, predation is seen as an important negative feedback control on population size and growth rate. The major limitation of the basic prey-predator model is that it does not include the overall system that is ultimately supporting the populations in question; therefore, results of the model are unrealistic in many environments with changing driving functions. Predation and grazing are, however, a part of all real systems studied. Castenholz (1961) indicated recognition of grazer feedback control when he examined the effects that snails and limpets had on attached diatom communities. His data with controlled grazer populations indicated an inverse correlation between grazer and algae, but he also found that highest algal growth rates were correlated with low standing crop. Therefore a grazer may stimulate net productivity by keeping its food cropped to some non-zero optimal level. experiments to examine a possible correlation between periphyton productivity and tadpole density. After studying grazing effects on primary production and species composition of the phytoplankton, Gliwicz (1975) hypothesized that the increased nutrient availability resulting from grazed algal populations drives a faster total productivity by a smaller population. eggs acts as a logic switch on periphyton biomass regeneration. experiment microcosms discussed by Cooper (1973). a.
interpretation of Cooper's system is illustrated in Fig. 3.9. Since Cooper did not precisely define the mechanism by which productivity might be enhanced at low algal density, two possible models are offered. Hargrave . (1970) found the same relationship between grazer density and primary productivity as Cooper when he controlled amphipod numbers in his in situ sediment microcosms. Maximum primary production was observed at densities of amphipods naturally found in the lake. He felt that grazing increased productivity by cycling nutrients and providing substrate for increased algal and bacterial growth. In addition, Fenchel and Harrison (1975) measured stimulation of decomposition by bacteria in grazing experiments with protozoans. Hargrave (1975) generalized these stimulatory effects to all deposit-feeding invertebrates that create additional space for microbial growth. These mechanisms are summarized in Fig. 3.10. Flint and Goldman (1975) found a stimulation of primary production in periphyton that were exposed to varying crayfish densities in Lake Tahoe. Besides obtaining verification of the theory of increased nutrient availability, they indicated that crayfish may speed nutrient cycling by seeding and conditioning excreted algal material for better bacterial growth. They also found that crayfish remove macrophytes that compete with attached algae for nutrients. Figure 3.11 shows a summary model of the crayfish-periphyton interactions discussed by these authors. may result in stimulated productivity. increased primary productivity by natural crayfish densities. The proposed mechanisms explaining consumer stimulation of primary productivity basically fit into two categories: 1. the stimulatory effect of cropping of senescent growth stages to optimal, low-density, maximum growth-rate stages; and 2. the regeneration and delivery of available nutrients for plant growth. In order to determine if both of these mechanisms can in fact generate stimulation of productivity and under what conditions they might do so, a simple model of consumer feedback was simulated. Figure 3.13 presents the model showing the two mechanisms discussed above. Consumers are modeled as an exogenous input to the system with a single function of moving biomass from the producer to the detritus pool. Nutrients may be in short supply or may be added to the system from an external source. The BASIC computer program used to simulate this simple model is presented in Table A.I. regeneration mechanisms are combined in a comprehensive view of zooplankton stimulation of primary productivity. these simulations is given in Table A.1. summarized the model results for the case when both mechanisms are operating together. A subsidy-stress (Odum et al. 1979) curve was found typical of those discussed in the literature review but with the possibility of more than one stimulatory region. Thus, this model suggests that either of the proposed mechanisms of stimulation or a combination of both of them may be responsible for the observed results. Cropping of primary producers to optimum growth stages can increase production at lowered standing stocks. Also, nutrient regeneration can be responsible for greater productivity at lowered producer populations. The generality of stimulation of primary production by consumers at optimum densities may thus be the result of several control mechanisms in nature. have developed toxic substances to control energy flows and theoretically to maximize power. Thus, plants have allelopathic chemicals and insects have venom. These substances represent a concentration of energies and have a high embodied energy. Human technological systems may be similar in this respect. Toxins are collected from nature or synthesized in laboratories for the purpose of controlling environmental energy flows. These substances also represent large energy flows and have high embodied energy. observations of this effect for heavy metals with no known biological role such as mercury (Rzewuska and Wernikowska-Ukleja 1974) and Cd (Doyle et al. 1975). Lamanna and Mallette (1953) continue: "While the universal occurrence of stimulation by poisons suggests the possibility for the existence of a single basic mechanism, the very diversity of chemical compounds and biological processes involved presents enormous difficulties to the imagination in conceiving of such a mechanism" (p. 599). They present several plausible mechanisms for this effect in biology, but based on more recent developments in theoretical ecology there is another important possibility: perhaps the mechanisms of the response vary, but the cause of these adaptations is consistentnamely, the criterion of maximum power. Thus, all organisms have evolved under selection pressure to maximize their life processes and have been continually exposed to minute concentrations of toxic metals, free radicals, and ionizing radiation. Given evolutionary time, mechanisms that utilize these "poisons" in stimulatory ways would be selected. In experimental toxicity studies, these low stimulatory levels are often below the range of the lowest concentration studied and when stimulation is measured, the data are often ignored. Stimulatory effects are evidences of organization for maximum power. Adaptive systems can gain by using substances with large effects. because of reduced competition from other organisms. Species with short generation times may quickly recover from a chronic toxin level through intensive selection pressure. By the same manner, ecosystems may adapt to continuous toxin inputs through redesigning food webs to contain resistent organisms. A look at some specific reactions to varying Cd concentrations will allow the formulation of some general toxicity models. Data from the literature are examined for the effect of Cd concentrations on growth in order to determine a general organism response to this toxin. Parameters of the storages examined were net yield, cell density, and chlorophyll content; and, the parameters of energy flow examined were growth rate, oxygen evolution for algae, and oxygen uptake by animals. Microbes. Hammons et al. (1978) reviewed the literature on Cd toxicity to microorganisms and determined that, in general, levels above 0.2 ppm were necessary to show a toxic effect on bacteria. Doyle et al. (1975) published data for several bacteria and one yeast in which toxicity effects were generally observed above 10-20 ppm (Fig. 3.15). A whole range of toxic responses is seen in this figure, several of which show some stimulation at the lower Cd concentrations studied (Escherichia coli, Streptococcus faecalis, and Lactobacillus acidophilus). (from Doyle et al. 1975). size, microscopic algae may have generation times of a few days while aquatic macrophytes generally have one generation per year. Although laboratory studies show similar sensitivities for these two groups, species replacement and redesign by plant communities are much faster in the algae. Most laboratory studies of algal toxicity have been made with the "laboratory weed" algae, which are easy to culture in artificial conditions. Sensitivity of these species to a chemical may not be typical of all algae just as their ease of culture is not typical of all algae. Nevertheless, the replicability of laboratory studies is useful in a comparison over a large range of concentrations of Cd. Figure 3.16 shows the effect of Cd up to 1 ppm on oxygen evolution in a blue-green algae, Anacystis nidulans, reported by Katagiri (1975). A concentration of 100 ppb was found to be inhibitory while 50 ppb gave a slight stimulation over controls. A small amount of photosynthesis was reported at 1 ppm Cd. 6.1 ppb with some cell growth still observed at 610 ppb. Once again a small stimulation of maximum cell numbers was reported at a concentration of 0.6 ppb Cd. Studying another green alga, Chlamydomonas reinhardii, Kneip et al. (1974) reported reduced growth at a Cd concentration of 10 ppb (Fig. 3.18) and almost total inhibition at 1 ppm Cd. Once again at the lowest levels tested, 0.01 ppb, a slight stimulation of net growth was observed. Figure 3.16. Effect of Cd on oxygen evolution by the bluegreen alga Anacystis nidulans in batch culture (from Katagiri 1975). quadricauda in batch culture (from Klass et al. 1974). (from Kneip et al. 1974). No controlled experiments of Cd's effect on aquatic macrophytes at a series of different concentrations were found; however, a large number of experiments have been reported from crop species of terrestrial plants. In hydroponic culture, Turner (1973) found the yield of garden vegetables (radishes, lettuce, beets, tomatoes, carrots, and swiss chard) to be lowered by 100 ppb Cd; yet tomatoes, lettuce, and radishes were all stimulated at 10 ppb Cd. Hydroponic culture of bush beans (Wallace et al. 1977) and beans, beets, turnips, and corn (Page et al. 1972) also showed yield reduction at 100 ppb Cd in solution, but no lower experimental levels were tested. Vascular plants, when grown in soil, show sensitivity only at much higher Cd concentrations. John and van Laerhoven (1976) found growth reduction of nine lettuce varieties at 1 ppm Cd and slight stimulation at 0.5 ppm. Wallace et al. (1977) found yield reductions of 60%-80% at Cd concentrations of 200 ppm in soil. Bingham et al. (1976) found slight reduction in growth of several pasture species at soil Cd concentration of 5 ppm. Animals. Many species of aquatic animals have been tested for sensitivity to Cd exposure. The most useful experiments to this report are those where some functional property such as metabolism, net growth, or reproductive capacity is determined for a series of Cd concentrations from just above background to severely toxic. LC-50 (the lethal concentration for 50% of the test organisms in a stated time period) values or survivorship curves may also be useful if they are determined for several Cd concentrations over the life span of the test organisms. Spehar et al. (1978) found that 27.5 ppb Cd severely reduced the survivorship of a freshwater snail, Physa integra, at 28 days, while concentrations of 3 and 8.3 ppb increased survivorship. Working with another freshwater snail, Biomphalaria glabrata, Ravera et al. (1974) observed severe Cd toxicity at 100 ppb. Respiration in tubificid worms was found to be enhanced by 10 ppb Cd by Brkovic-Popovic and Popovic (1977) and decreased with respect to controls at 60 ppb (see Fig. 3.19). The percent survival of a mayfly, Ephemerella sp., was considerably reduced at the lowest concentration tested (3 ppb Cd) by Spehar et al. (1978). days on fathead minnows, Pimephales promelas, was reported by Pickering and Gast (1972). As may be seen in Fig. 3.20, both parameters were reduced compared to controls at 30 ppb, but egg production was greatly stimulated at 15 ppb Cd. Benoit et al. (1976) found embryo viability in brook trout to be inhibited at less than 1 ppb Cd (Fig. 3.21). Survivorship in two other fish species, bluegill sunfish and largemouth bass, was lowered at 8 ppb in laboratory tests reported by Cearley and Coleman (1974). Summarizing the review of Cd toxicity, animals have sensitivity similar to that of plant and algal species. Concentrations of Cd as low as 30 ppb are toxic to many aquatic animals, and some sensitive organisms or life-history stages are sensitive to less than 10 ppb. Cadmium at low levels may enhance functional parameters in aquatic animal species, but toxicity is highly dependent on hydrogen ion, ligand concentrations, salinity, and temperature. All curves of toxicity were similar to one of the three graph forms in Fig. 3.22.
worms in static culture (from BrkovicPopovic and Popovic 1977). c. General curve with optimum concentration. Figure 3.22a represents an accelerating effect of Cd concentration on growth reduction presumably resulting from a drain on the structure remaining. Figure 3.22b illustrates a decreasing effect with concentration indi.cating a saturation of the toxic action at elevated concentrations. Figure 3.22c may be the most general in that the other two are special cases. This is the typical Arndt-Schulz effect curve described for all poisons by Lamanna and Mallette (1953). Whether these low-level, stimulatory effects are real or statistical artifacts cannot be proven in this review; however, the consistency of this stimulatory effect warrants its inclusion in the Cd-toxicity models that follow. Models. If general models of Cd effect are recognized, data from diverse experiments may be organized in terms of model parameters and more precise comparisons can bemade. Although only species-effect data have been reviewed for Cd toxicity, the models presented are descriptive of trophic levels, also. In Section 4, these trophic-level models are combined in an ecosystem model calibrated with data from the Cd streams study of Giesy et al. (1979). Numerous mechanisms of Cd toxicity have been-suggested for particular organisms and groups of species. As reviewed by Hammons et al. (1978), most of these mechanisms result from inactivation of enzymes by binding Cd with sulfhydryl groups of proteins interfering with photosynthetic and respiratory pathways of energy transformation. Although no known requirement for Cd exists in living systems (Hiatt and Huff 1975), the stimulatory responses measured at low Cd concentrations must result from some beneficial mechanisms. Three models of Cd action are presented to generalize these experimental results. Figure 3.23 illustrates a model of the overall effect of a toxicant on storages as a product of storage and toxicant. A BASIC computer program of this model is given in Table A.2. The curves generated by this simple model are typical of the results seen for many studies in the literature (see Figs. 3.15-3.21). Figure 3.24 summarizes the effect of the toxicant in a more mechanistic manner. In this model, Cd is represented both as a required nutrient for organic synthesis and as an inhibitor on metabolic feedback processes such as enzyme reactions. The computer program for this model is given in Table A.3. Figure 3.24b presents representative output for this model at two toxicities for several toxin concentrations. These curves show a stimulatory region for the metal as well as the stress region more generally considered. In Fig. 3.25a toxic action is combined with nutrient recycle. The computer program is given in Table A.4. A wide range of toxicities and nutrient uptake rates were examined and stimulation of production was found at some combinations even though biomass was simultaneously reduced (Fig. 3.25b). The optimum effect was the result of an increase in available nutrients and would not be found in systems with nutrient excess. In summary, we conclude that observed Cd toxicity data may be generated from simple models of toxin interaction for organisms or trophic levels. Models of toxicity must include more than just negative interactions such as those in Fig. 3.23 to be inclusive of the Arndt-Schulz phenomenon; however, for producers, stimulation is possible indirectly through nutrient recycling (Fig. 3.25). Figure 3.23. Model of toxicity as a drain on biomass. a. Model; b. Representative output for three values of K3. BASIC program used for simulations is given in Table A.2. stimulatory function and an exponential toxic function. a. Model; b. Representative output for two toxicity levels. BASIC program used for simulations is given in Table A.3. In order to generalize on Cd uptake ability, a short review is made of curves of Cd uptake as a function of Cd concentration for various groups of organisms. A simple computer model is presented that generates similar results. Through passive and active concentrating mechanisms, biological systems can have a large impact on cycling of minerals in nature. When absorbed or adsorbed by a motile organism, elements may be transported and relocated in a system. Through uptake and death, an animal or plant may store toxicants for varying time spans, effectively removing them from biological circulation. If inputs of a metal such as Cd are low, biological uptake may greatly lower effective toxin concentration. Mechanisms of storage are systems of detoxification. However, when systems receive chronic elevated inputs, detoxifying systems may be overloaded. Different species have variable abilities to remove Cd. Through system selection, species with high resistence to Cd and detoxifying mechanisms may be selected at elevated Cd concentrations. Unfortunately, few of the reported experiments were conducted in flow-through systems with continuous Cd renewal. In this review it is assumed that the researchers monitored Cd concentration at the end of each experiment and would have reported any major depletion. (from Doyle et a]. 1975). effect and was able to concentrate Cd from solution by a factor of 2000X. Of the microbial organisms tested, Bacillus cereus had the greatest concentration factor with a value of 3870X at 10 ppm Cd in solution. Plants. A great number of Cd uptake studies have been made for plants and algae. Two representative curves are shown in Figs. 3.27 and 3.28. The uptake of Cd was studied by Hart and Cook (1975) for Chlorella pyrenoidosa at a series of Cd concentrations (Fig. 3.27). Hyperbolic uptake was observed with the highest concentration factor reported as 4500X. Other workers have found Cd concentration by algae of 2000X for Anacystis nidulans (Katagiri 1975); 4000X-6700X for marine diatoms (Kerfoot and Jacobs 1976); 80,OOOX for mixed algae (Kumada et al. 1973); and 10,OOOX for marine phytoplankton (Knauer and Martin 1973). Although these concentration factors are dependent on water chemistry as well as reaction time (see Fig. 3.27), they represent significant immobilization of Cd in biological systems. Figure 3.28 presents an uptake curve for the aquatic macrophyte Najas guadalupensis reported by Cearley and Coleman (1973), which is representative of Cd uptake by plants at increasing metal concentrations. At a Cd concentration of 100 ppb in solution, a concentration factor of 40,OOOX was measured. Giesy et al. (1979) reported Cd concentrations >40,OOOX for roots of Juncus diffusissimus and 1O,OOOX for leaves in stream microcosms. static culture (from Hart and Cook 1975).